This extremely fine grained special pigment powder gives you the key to create beautiful and eye-catching effects with a very simple and quick nail art technique. 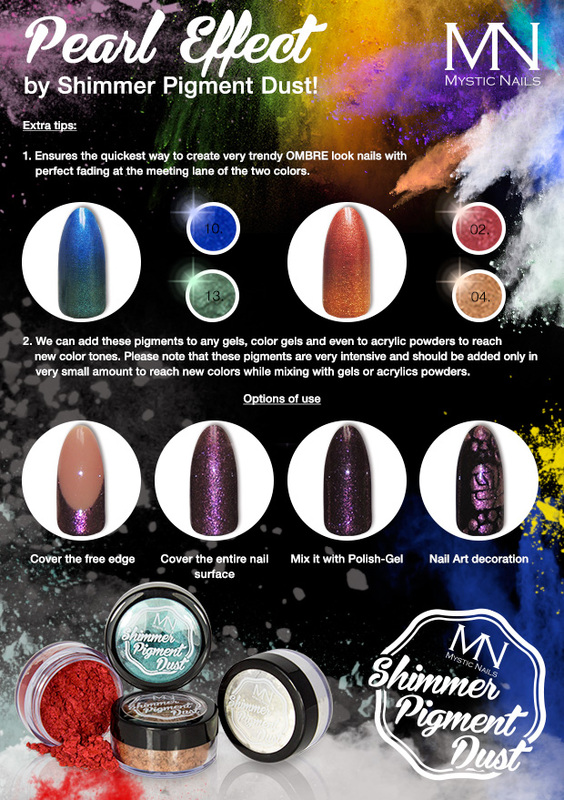 Shimmer Pigment Dusts provide many options as you can cover the complete nail or only the free edge but it is also possible to make nail art decorations with them. 1. Apply the ColorMe! Polish Gel (Night Fever) in two layers and cure both layers separately and completely. 2. Apply the Shimmer Pigment Dust (08) with the natural haired brush on the tacky residue of the Polish-Gel. Remove the surplus of the pigment which does not stick in the gel with the same brush. 3. Cover the entire nail with ColorMe! Base/Gloss. 1. Ensures the quickest way to create very trendy OMBRE look nails with perfect fading at the meeting lane of the two colors. 2. We can add these pigments to any gels, color gels and even to acrylic powders to reach new color tones. Please note that these pigments are very intensive and should be added only in very small amount to reach new colors while mixing with gels or acrylics powders.